fancy a change , my sept 2017 sx tourer up for grabs , absolutely mint condition full service history . panniers have never been on the bike still wrapped form new . new michellin 5's fit at last service done around 400 miles ,bike showing 3400 miles now, will be sold with front fender extender , oxford heated grips , rad guard , lowered pegs and the original's, slash cut pipes and the original exhausts which were only on for around 1000 miles , voltage and usb socket . 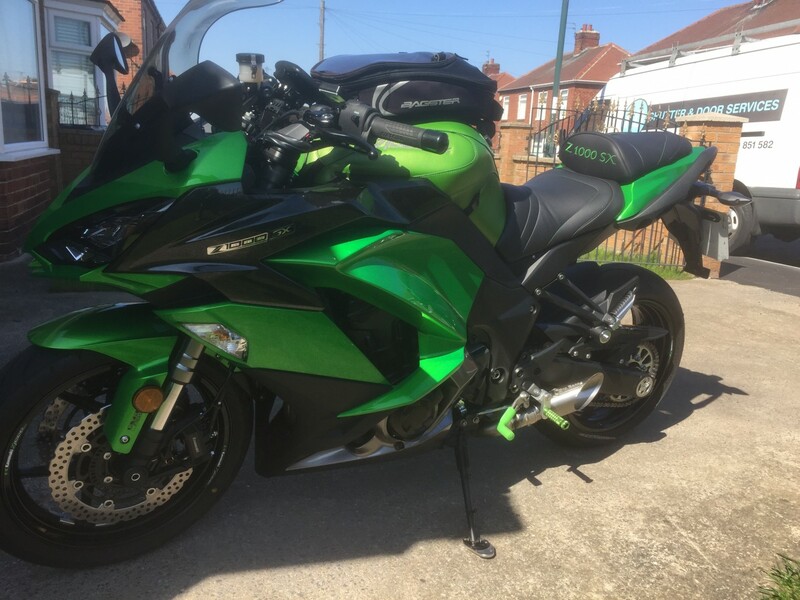 wanting offers £8250 , have the metallic green bagster tank cover , garmin sat nav , and top sellerie comfort seat which are negotiable, bike still has remainder of Kawasaki warranty till sept 2019 with the option to extend . don't think you would find a cleaner example , will do a video later and see if i can post it..
Hi Keith, do you still have the bike. Been looking for an SX for a while. Are the slash cuts baffled at all, coz they look very loud...lol. I have been looking for a bike with the Akro's fitted. They are deeper and a bit louder but not much at all. No baffle but I think Keith has made his own baffles. Thanks Ninjamaster, It's a long way for me to travel to find out I didn't like the sound of them. From your message I think they will be fine. No worries mate. I actually got mine after seeing keiths on here and talking to him over pm about them. I found them a great balance deeper and just loud enough to for others to pay attention. They take 5 mins to put on and take off.. Thats cats still in place so that change in volume isn't massive from stock. Am sure Keith will chime in at some point.